First things first, due to computer being a bit of a pain the photos will follow shortly. Well what a bank holiday weekend it has been, first one this year where we have actually had both cars to work on. Plus maybe a couple of side projects. Well after a bit of time with little progress this weekend has been a big jump. Most of the delays have been down to the issue with the bushes we last reported in the poly bushes being too short and a gap being in the chassis. 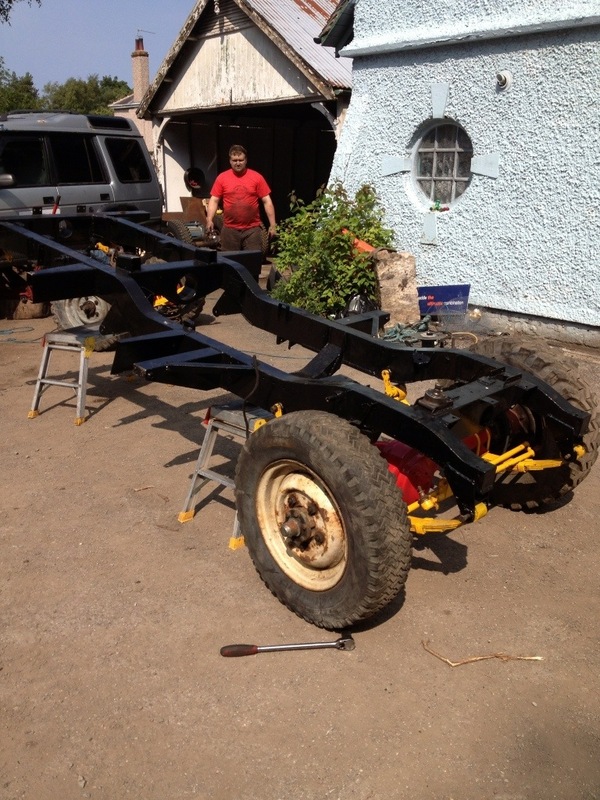 So new bushes were purchased and then on Saturday using a fly press pushed them in to the axles and chassis. After noticing a bit of weakness in the rear cross member welding we decided to weld in some plates to strengthen the mount, so some grinding and welding later we are happy its stronger. 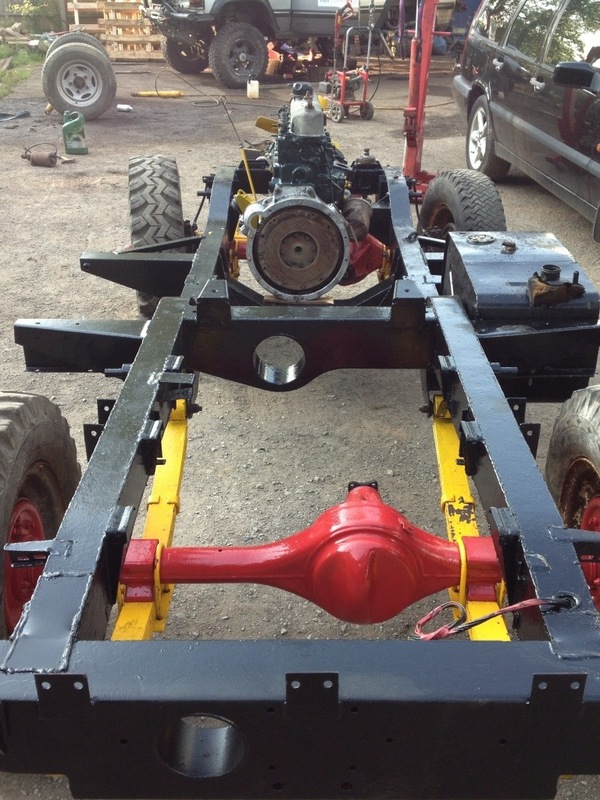 So the paint was touched up and the axles all bolted to the chassis hopefully for the last time. 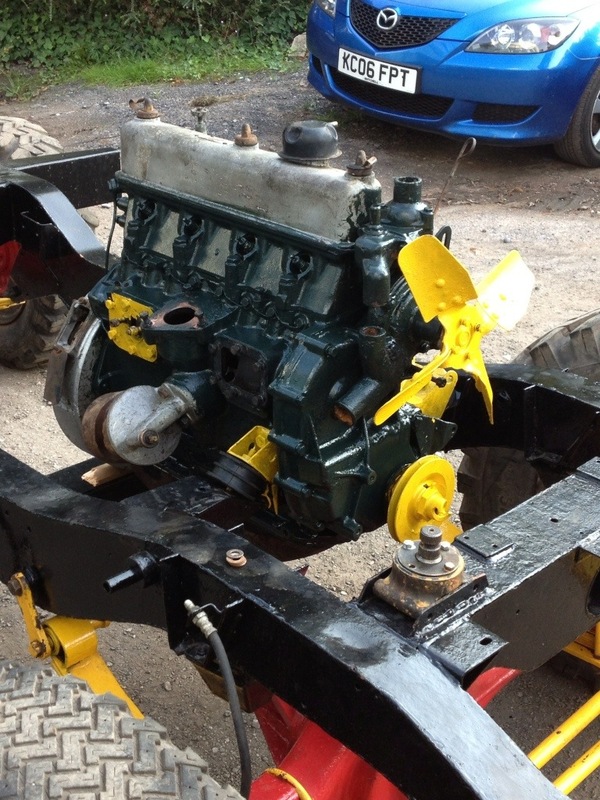 Next up the engine came back to the build location after a checking over, a quick coat of green paint it was mounted back to the chassis along with the fuel tank. Also trial fitted the bulkhead and wings from car 2. Well this week we have removed all the last bits from the old chassis, the last bits off were the A Frame and brackets, these were heavily rusted so required grinding off. These will hopefully be in Tuesday morning and back this week. The axles for the car were also rubbed down and primed ready for painting before they go back on hopefully before the weekend. While the axles were dry and not yet bolted to the car we decided to change the bearings and brake disks. Again the fly press helped pushing the bearings in to place and in the day the rear axle was done, just the front to do now. After a bit of work this project has been put on hold for now and may be scrapped in the future, we shall see. 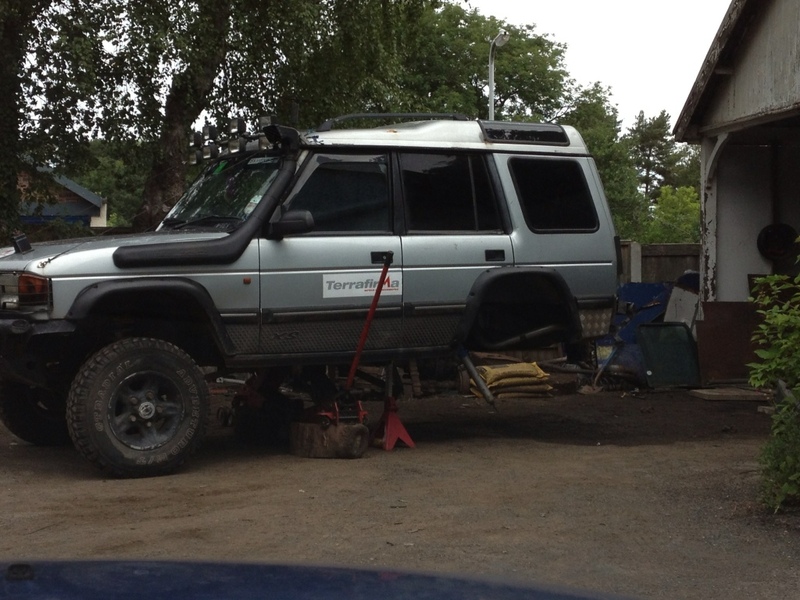 A silver 300 tdi disco, this is a normal road car for one of the lads, after smashing a rear diff earlier this year a replacement pan was welded in to place but had always had a little leak as it was welded in place, so as the weather was nice we decided to remove the axle and weld in the garage. After trying we found it still leaked so the axle is still off for now so this will be on going for now. Well car 5 strictly shouldn’t appear on the blog as its not a Land Rover and the owner doesn’t have a Land Rover but he is one of the group of friends so we are putting it on. The car is a Toyota Celica Race car that is a just starting project, There is no clear direction yet but we shall update the blog with more information. This weekend no work was done, but we did sell a spare set of wheels that came with the car so all good for now. 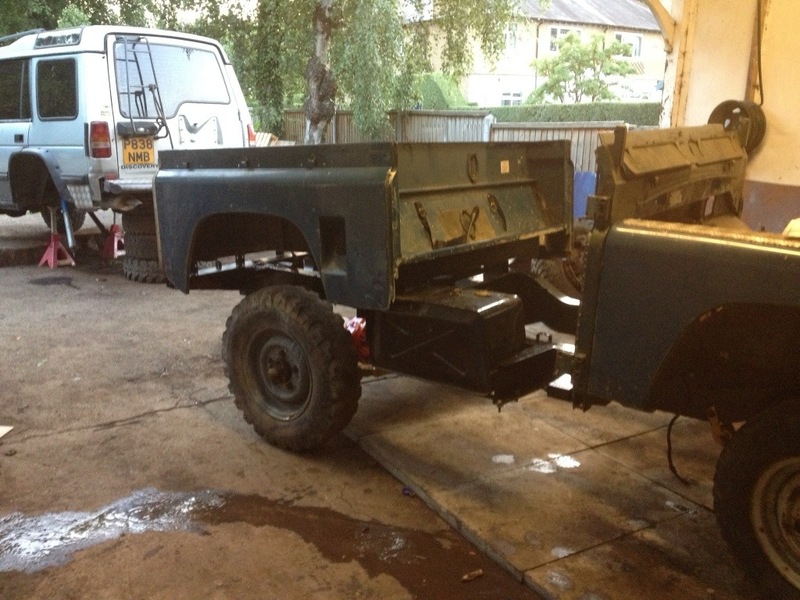 This entry was posted in 1966 Series 2, 1983 Ninety, 1993 Discovery 1 and tagged 1966 Series 2, 1983 Ninety, bushes, Chassis, Land Rover, painting, Parts, Progress, rebuild, Wirral on August 26, 2013 by landyrebuilds. Makes a change to have such good weather over a bank holiday too. Yeah it was a great weekend, in fairness if the weather had been a bit nasty we could have gotten away with it but yes the sun helps. My parts went in to shot blasting this morning so they should be ready tomorrow hopefully. 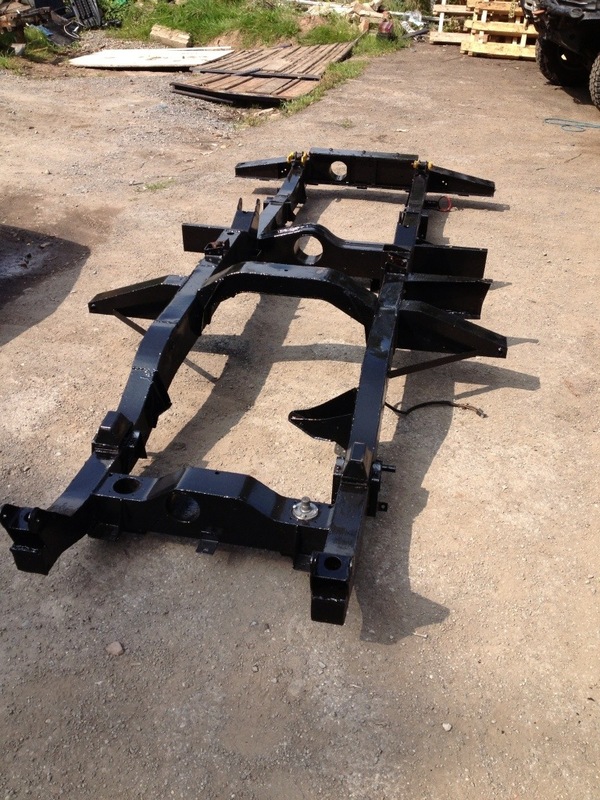 Then will be get them painted and bolted back on to the chassis.